Unwed Sailor is an instrumental ambient rock band from Seattle, Washington, led by Johnathon Ford (Pedro the Lion, Roadside Monument). They’re also one of Shrieking Tree’s earliest clients. I developed the previous version of this web site in 2004, and now, more than a decade later, I’ve redesigned it to coincide with the release of their new EP, Take a Minute. I love this band, and the web site holds a lot of great memories for me. Unwed Sailor is an instrumental ambient rock band from Seattle, Washington, led by Johnathon Ford (Pedro the Lion, Roadside Monument). They're also one of Shrieking Tree's earliest clients. 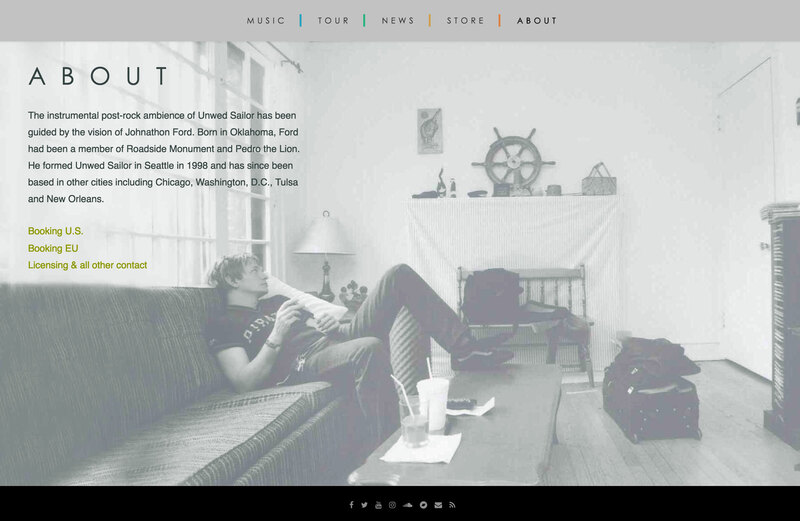 I developed the previous version of this web site in 2004, and now, more than a decade later, I've redesigned it to coincide with the release of their new EP, Take a Minute. I love this band, and the web site holds a lot of great memories for me.